A Major Shift: Are We Really Idolators? Would I be off track if I said I think that many of us are idolators? Meaning, we worship false gods? You are not old enough to understand this at present. Your favorite thing is your "BB", and that's about all you need to be happy. There seems to be a high that comes when we find something to connect with and worship. I remember once meeting someone who I was a major fan of. I was so excited to meet her that I began coughing because my mouth got so dry from the excitement of it all. I chalked it up to being excited to meet a new friend. But no matter what I thought then, I realize now I was idol worshiping. Oh, thou fabulous famous person, you are so much better than I am and so I'm hyperventilating at your greatness. Kind of repulsing when I think of it. Should we ever be so anxious/excited to see a living human being that we get that nervous? Should we care if a human being touches our hand at a concert or devotional, simply because they're famous? Should we hang posters of baseball players in our bedrooms, because they're quite talented? Should we look up to them as role models? In regards to our religion, I was struck by an article I stumbled upon where someone posted about the oddity of being offended when a church leader's name is read in the news without including the middle initial. I found myself guilty. Why would I be offended that a church leader's name would be read just like any other human being, without their middle initial? Are they all lawyers, or clothiers (like "Joseph A. Banks")? Having realized this, I feel a little sheepish, reading some of the LDS themed online articles which are written solely for the purpose of allowing voyeurism of these men and women. It doesn't feel comfortable anymore. Putting one human being, or any kind of fandom, above or before God, is idolatry. Worshiping a false god. 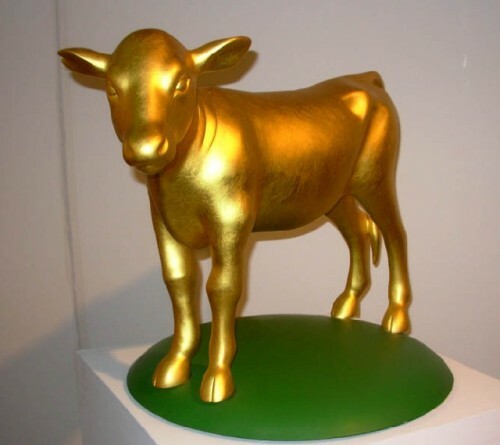 It might not be a golden calf, like Aaron shaped at the children of Israel's wishes. It might be more subtle than that, but in some ways, it's still overt and highly visible, if we take a moment to ponder it. Like my post a bit ago, where I was lamenting how little money I had. Idol worship. GUILTY!!! Some worship status. Some worship fame, or public acclaim. Some worship worldly goods, like a fine, clean home. Some worship news figures, some worship sports and either watch or play all day. Some obsess over the latest music, their musical talents, or other hobbies like art, travel, homemaking, or business. Some (like me) have trouble with addictions like facebook or texting, or even blogging or surfing the net. Some have addictions to political parties, and only their party will save the country, the continent, or the world. Others worship more severe addictions that I prefer not to even speak of. As a country, President Kimball lamented that we trusted more in the arm of the flesh, building up a massive military, than the arm of God. We worship the salvation and security promised by guns and steel, rather than praying to God for our salvation, like the Nephites or Ammonites did. We are idol worshipers. Daniel, it's time to change. I'm not quite sure how, besides first becoming aware of it. It's certainly hard to overcome our habits. But to know Him is to overcome the idols.